Confirmation is especially significant at our parish as the Holy Spirit is our special patron. 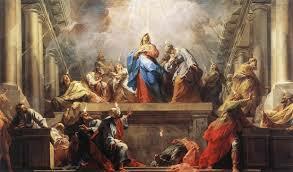 You will receive the personal gift of the Holy Spirit like Mary and the Apostles did at Pentecost and His seven fold gifts of wisdom, understanding, counsel, fortitude, knowledge, piety and fear of the Lord. Children normally are confirmed during 8thgrade after being prepared by the parish school or by the religious education office or by an approved home school program. If your child did not receive this Sacrament and is in high school, we would love to help you bring the gift of the Holy Spirit to his or her life. Please see Religious Education to sign up for Confirmation Preparation Classes. Adults who are not yet confirmed are very welcome to prepare to receive this Sacrament. It is a beautiful process and even life changing. Please see the RCIA (Rite of Christian Initiation) section under Religious Education for more information and to contact us.